Matrix metallopeptidase 9 (MMP-9) is also known as 92 kDa type IV collagenase, 92 kDa gelatinase or gelatinase B (GELB), CLG4B, is secreted from neutrophils, macrophages, and a number of transformed cells, and is the most complex family member in terms of domain structure and regulation of its activity. . Structurally, MMP9 maybe be divided into five distinct domains: a prodomain which is cleaved upon activation, a gelatinbinding domain consisting of three contiguous fibronectin type II units, a catalytic domain containing the zinc binding site, a prolinerich linker region, and a carboxyl terminal hemopexinlike domain. 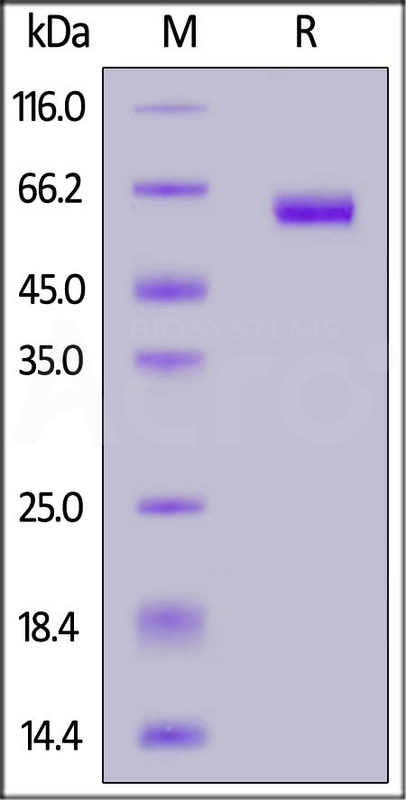 This enzyme degrades various substrates including gelatin, collagen types IV and V, and elastin. MMP9 is involved in a variety of autoimmune diseases such as systemic lupus erythematosus, rheumatoid arthritis, and multiple sclerosis, and be regarded as a potential therapeutic target. Hirose Y, et al., 2008, Am. J. Hum. Genet. 82 (5): 1122¨C9. Mira, E. et al., 2004, J. Cell. Sci. 117:1847-1857.